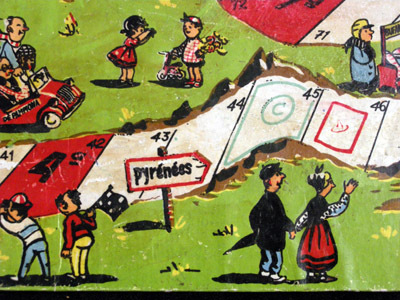 Hard-to-find Spanish 50s game with fantastic artwork by Lizarraga. I have been looking for a decently complete version of this game for more than a decade. I have finally found it. 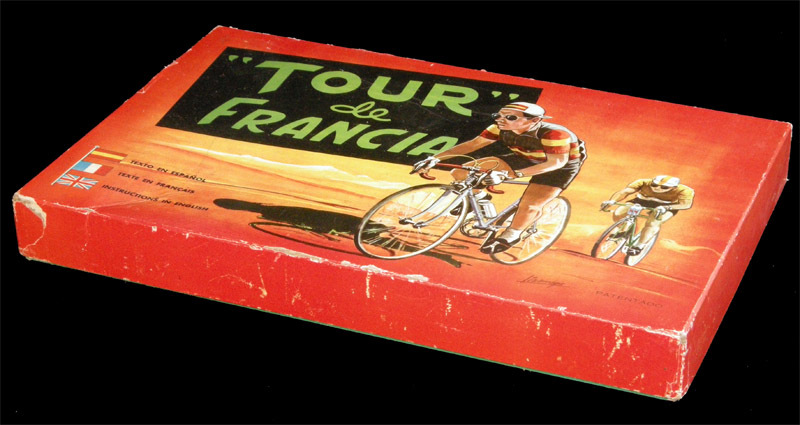 I was not sure whether all the parts belonged to the same game, but I was quite sure that at least the rules were of a game from the end of the 50s (among other things, they metionned Bahamontes, Coppi, Bobet and a rider from Luxembourg, which can only be Charly Gaul,. 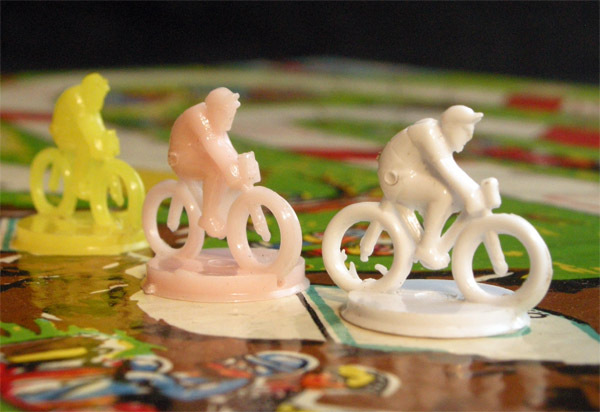 The riders looked too small (they are barelu 2 cm), one of the smallest in any cycling game in my collection). 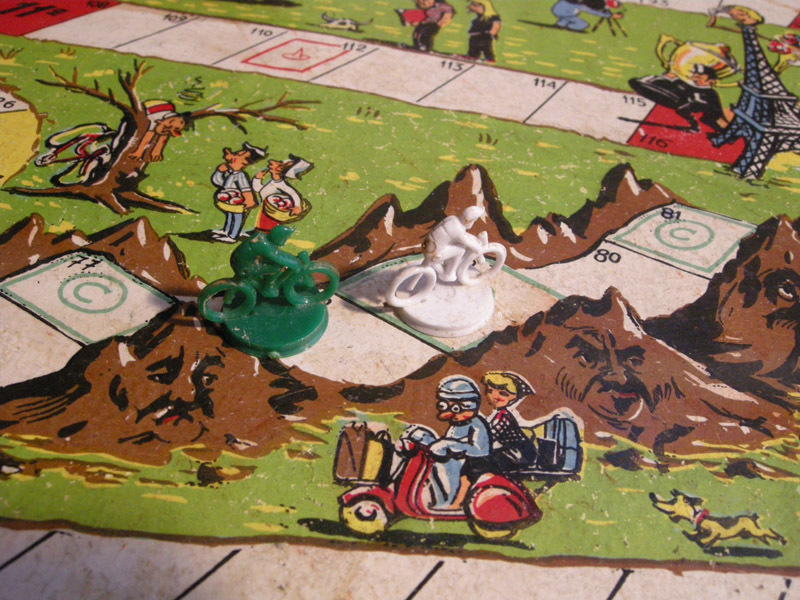 Still some years later I was lucky enough to purchase a board which, by this time, I could readily identify as belonging to this game. But it was not until 10 years after the first find that I have been able to purchase a complete copy of the game. As it always happens in these cases, I did not have to pay much for it. 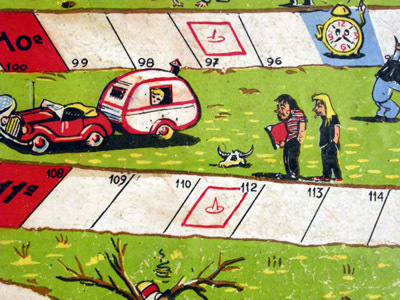 Later on I even found more copies of the game. 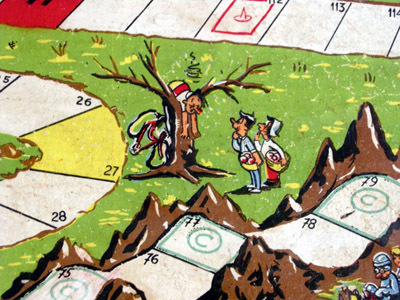 The game's rules are disppointingly simple, as in most games of the 1950s. 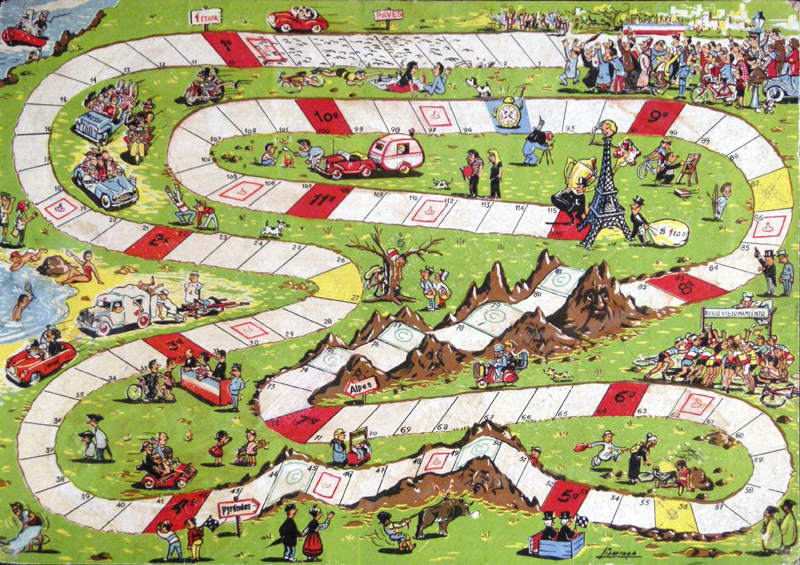 There are two sets of rules, the second of which adds extra rules. They could probably be labelled "advanced rules", but there is nothing advanced about them. 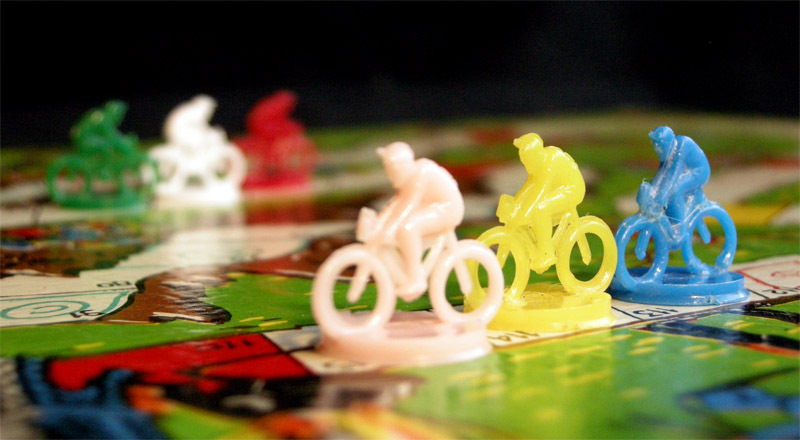 Basically, players roll one die and move their cyclist accordingly. 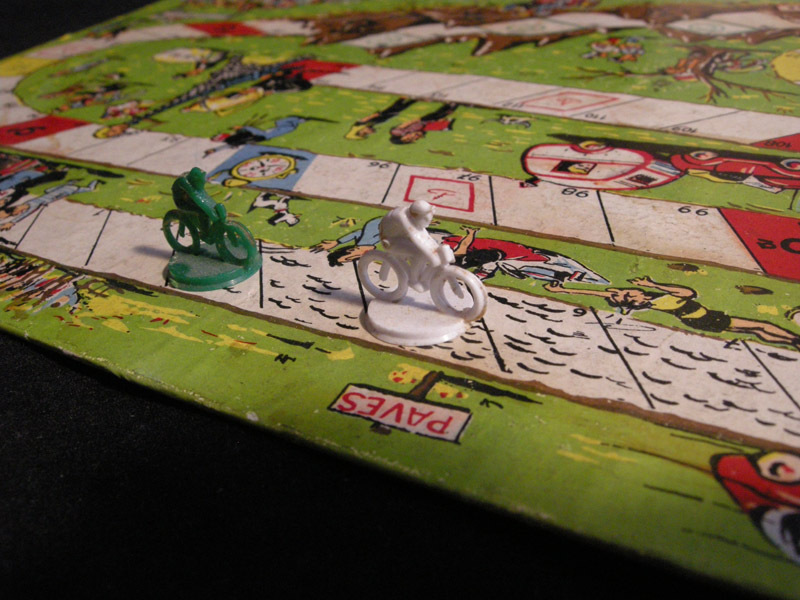 Riders that fall on a square occupied by another rider change their places (they send the other rider to the square where they started their movement). 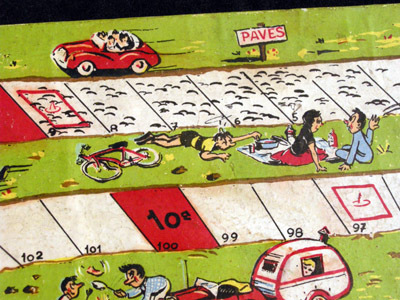 Of course, we find the usual incidents: squares with a red tack are punctures (go back three squares), while yellow squares are serious falls or exhaustion (go back to starting line). 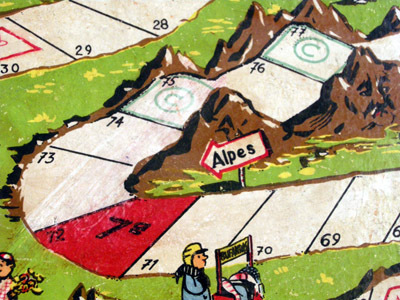 In the basic version of the rules, the first rider to reach squares marked with a "C" (hills) or tenth stage (time trial) get honours ("conqueror of the mountain", "winner of the time trial square). These are useless for the game (and it is not even explained what happens with subsequent hills). To reach Paris riders have to throw the exact number. If they don't they go back the rest of the throw. 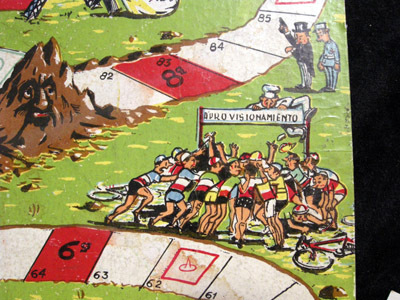 The advanced rules give points to the first two players to pass the hills (2 and 1 pint), to the first three players to pass each stage (9, 6 and 3 points, called "Premio de las Naciones", "Prize of the Nations") and to the first player to pass stage 10 (15 points, winner of the time trial stage). 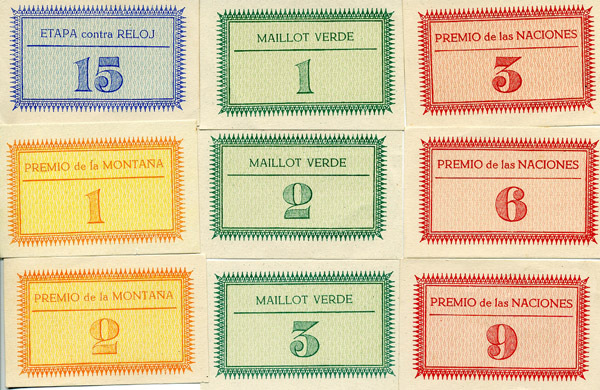 There are also 3, 2 and 1 green jersey points awarded to the first rider to pass each stage city. These points are given to the same players than the "Prize of the Nations", of course. Prices for the "advanced" set of rules. However, there are lot of prices awarded. 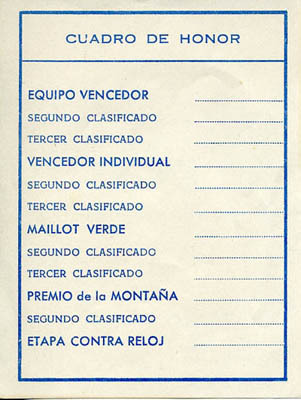 The "Prize of the Nations" points are supposed to be awarded to the team while the green jersey points are supposed to be awarded to an individual rider (whose name must be handwritten in the corresponding space of the points sheet. 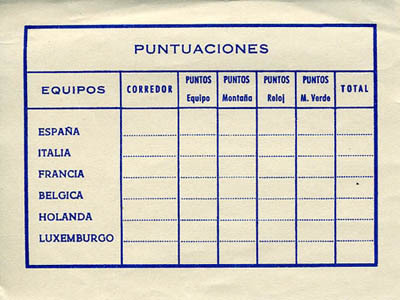 Thus, even if in fact 12 points are awarded to the first rider to pass each stage square (9 for the "Prize of the Nations" and 3 for the green jersey), these are added in different columns. 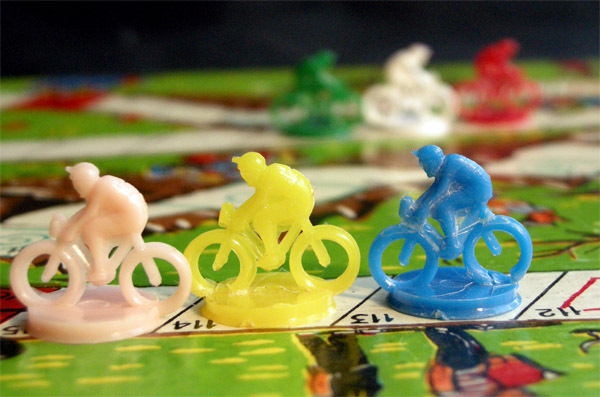 The rules make clear that the most important classification is the team classification (simply adding up all the points), but there are winners for the other classifications. Who is the "individual winner" is not clear. I suppose it is the first rider to reach Paris. 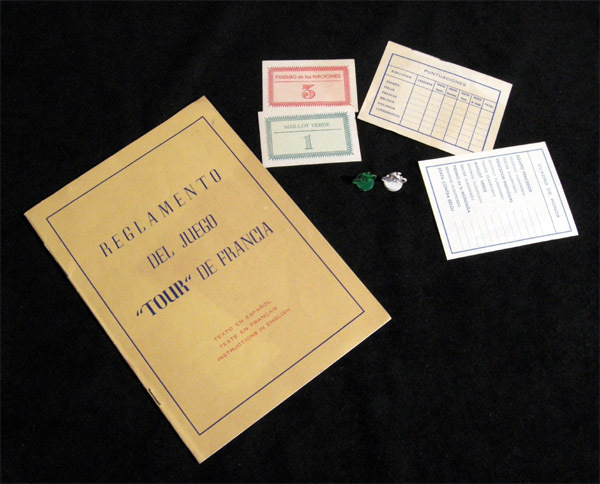 By the way, the rules of the game (but not the winners' tables) are in Spanish, French and English, which is quite unusual in a Spanish game of this age. The board is flat, but it has a nice 3D effect. UPDATE: There are two editions of the game, as you can see in the picture below. 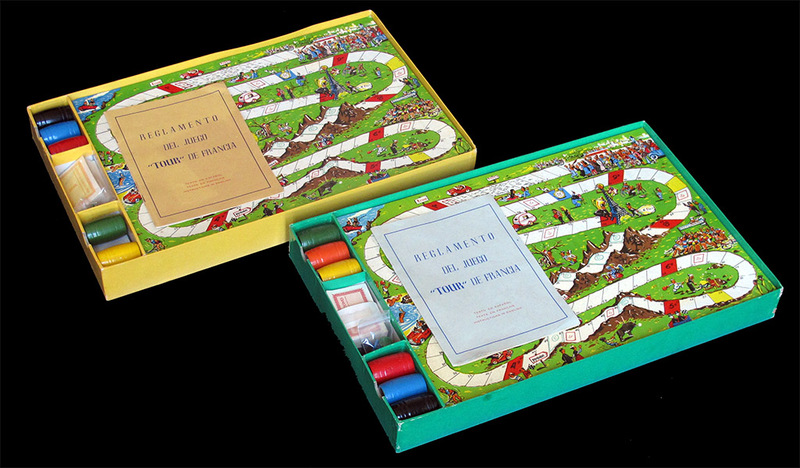 In one of them the box tray and the booklet are green, in the other they are yellow. Otherwise, the contents (and the box cover) are identical. One goblet is missing in the yellow box.